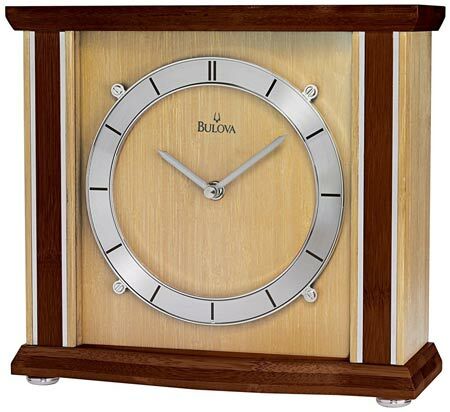 The Bulova B1667 Emporia Mantel Clock is a modern mantel clock using solid panels of sustainable Bamboo with dark walnut accents across the top and bottom of the case. There is a stained Walnut accent stripe on either side of the face that is accented by strips of chrome. The remainder of the case is a natural finish on the Bamboo. This clock features a no-glare spun chrome raised chapter ring with single black dashes to mark the hours and a double dash at the 12 o'clock position. The feet are chrome and the hands are straight and silver. The accurate Quartz non-chiming movement requires one AA Battery. Clocks for sale at The Clock Depot including the B1667 at discount prices.